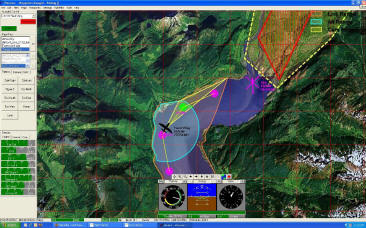 MicroPilot’s HORIZONmp Ground Control Station Software has the features you need to operate safe, repeatable missions. Map annotation and user definable no-fly zones let your UAV operators add the information they need to their maps. Digital Terrain Data Ready: take advantage of Digital Elevation to simplify operation. Safe Terrain Range Displayed on Map so your UAV operators can tell where to fly. Safe Comm. Range and Safe Terrain range on Map reduces UAV operator workload. Terrain look helps prevents terrain conflicts. No-Fly Zone look ahead warns users before they violate a no-fly zone. Comm Link out of range look ahead helps prevent loss of link. Automatic safe return home altitude maximizes your ability to recover your UAV in the event of a loss of communications.